International attention through many mediums including the Indymedia network has aided in the release of Jacquelina Lopez Almazan, leader of the Oaxacan Popular Magonist Antineoliberal Coordination (COMPA). Rather than celebrating, COMPA is intensifying their campaign to release the remaining political prisoners and hold the president of the Mexican National Human Rights Commission (CNDH) accountable for human rights violations. The Austin Indymedia Center has been working with COMPA and its affiliates for four years. Austin IMC has exposed intitutionalized paramilitarism, and state sponsored abuses in Oaxaca on multiple occasions. 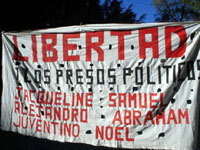 Most recently ATXIMC initiated a campaign to demand the release of these political prisoners. On February 3rd the leaders of COMPA were preparing for a dialogue with the governor that had been facilitated by the CNDH, in response to an attempted massacre in Santiago Xanica, Oaxaca. Instead of negotiations they were arrested and taken to prison on trumped up charges. Recently, around 70 members of COMPA began a permanent sit-in at the entrance to the National Human Rights Commission (CNDH) of Mexico to protest the commission’s complicity in the Oaxacan governor’s violations of constitutional guarantees. Castulo Lopez, a COMPA representative, stated that the sit-in will continue until their demands are answered. The right to free expression, organization, travel, and indigenous law mean nothing in Oaxaca and are not respected, asserted COMPA members. As of 5:00pm Thursday, March 3rd, the activists had not heard a response from the CNDH president Jose Luis Soberanes. The resignation of Jose Luis Soberanes as president of the CNDH. The reestablishment of constitutional guarantees. Respect to all Oaxacan citizens. Liberty for all Oaxacan political prisoners and COMPA members. An end to violations of social activist’s civil rights, who live in fear for their lives. Mexico is party to several international treaties that prohibit human rights violations, including torture, arbitrary detention, extrajudicial execution, and forced disappearance. The Mexican government’s obligation under these treaties is not only to prevent violations, but also to investigate and prosecute any violations that do occur. This is the most recent campaign letter, endorsed by Noam Chomsky. Please read, send, and distribute. We, the undersigned individuals and organizations, have been notified of clear civil and human rights violations in the state of Oaxaca, Mexico. • That these arrests are a politically motivated retaliation to the detainees’ involvement in social movements in Oaxaca, particularly the current sit-in at the Zocalo in Mexico City, protesting the January 15, 2005 attempted massacre in Santiago Xanica, Oaxaca. • Reinstate all constitutional guarantees afforded to its citizens without discrimination, including but not limited to: freedom of expression, freedom of the press, and free transit. We have been notified of additional actions being taken by COMPA and other organizations in Mexico City and in Oaxaca City, and we will remain vigilant to ensure the preservation of their constitutional rights to freedom of assembly and expression. We will be setting appointments with local Mexican Embassies and consulates in order to initiate a direct dialogue with the Mexican Federal government about these matters. We are gravely concerned about these matters and look forward to an immediate response to this letter.